Housing and Residence Life offers several exciting living options for students called Living Learning Communities. These communities create a dynamic learning environment for students by providing experiences connected to a topic unique to their residence hall. Living in a Learning Community is a great way to meet people who share similar interests and interact with a variety of faculty and staff who possess expertise in your interest area. Fully participating in an LLC also offers you the opportunity to start on, or even complete your Service Learning hours through a team project. Note that you will have the opportunity to preference your top two LLC choices in your housing application. Be knowledgeable about campus resources, and find motivation to use them. Take on leadership roles within and contribute to the growing dynamic of the LLC. Feel an increased sense of belonging, purpose, and connection. Be better prepared for transition into sophomore year. Obtain an understanding of what it means to achieve independence. Set goals for what you want to accomplish in your four years, and a plan to achieve it. Course Recommendations/Requirements will be sent to each student, along with their housing assignment, prior to Summer Orientation. Please work with your Academic Adviser to enroll in LLC affiliated course(s). Aspiring Educators as Collaborative Leaders is an LLC designed for students who are interested in becoming an educator at any grade level and subject area including special education. The goal of creating this community of learners is to support, develop, and empower aspiring educators to become collaborative leaders and advocates for all K-12 pupils. Students in this learning community will explore the role of a teacher, enhance their leadership skills, learn about admission requirements to the teacher education program, participate in volunteer opportunities related to teaching, connect with faculty and staff in the teacher education program, and be paired with a peer mentor from the Aspiring Educators student organization on campus. Are you equal parts excited and nervous about your first year at UW-Eau Claire? Would living with other first year students who are experiencing the same transition that you are give you confidence? How about if we told you that we have caring and dedicated staff who have designed a series of activities that will help ensure your success if you participate fully? In the First Year Residential Experience (FYRE) our intent is to help "spark" your success. In the Fall Semester, we'll help you bring the large scale of the University down to a more personal size - making it easier to find opportunities for involvement that meet your interests and personality. At the same time we'll introduce you to campus resources that help you achieve academically. In the Spring semester, when you are more settled and comfortable, we'll stretch you -- connecting you to on-campus employment, helping you confirm or select your major, and asking you to consider making commitments to follow your dreams for college. The Global Learning Community provides an opportunity for domestic and international students to live together and engage in learning experiences related to living in an increasingly global society. Opportunities exist in the GLC for students to prepare for study abroad and for students returning from study abroad to share their experiences. The GLC is open to all students who desire to learn more about global issues. The Healthy Living Learning Community provides students an opportunity to become engaged in all aspects of maintaining a healthy lifestyle. It includes in-class and out-of-class experiences designed to learn about a wide range of wellness topics including but not limited to stress management, healthy eating habits, a variety of exercise options and the spirit-mind-body connection. The Healthy Living Community includes a variety of specialized educational programs sponsored by the Kinesiology Department, the Student Wellness Advocacy Team and Student Health Services. This community is offered to all students on a space available basis. The Hmong Culture LLC is designed to provide a supportive and encouraging environment for students who are interested in learning about Hmong heritage, history and culture. This community is designed for all students: those who personally identify with their Hmong heritage as well as students who are non-Hmong and have an interest in Hmong Culture for their personal, academic and professional development. Students will also take part in monthly activities aimed at sharing both traditional and contemporary Hmong cultural practices in a fun and social way. Participants will be able to join together in travel/immersion trips to learn about the development of Hmong culture in other areas of the United States. The Hmong Culture LLC will work together to raise funds and secure grants to make trips affordable for students. Program Location: The Hmong Culture LLC is located adjacent to the Leadership LLC in Governors Hall, and the two communities will work together closely for shared events, and to develop multicultural leadership competence. Students accepted into the University Honors Program may join the Honors Learning Community on a first-come, first-served basis. Located in Bridgman Hall and led by dynamic Honors RAs and Honors student mentors, the entire Bridgman Community houses approximately 242 honors students who live, study, play and grow together with like-minded peers! The community will be a center for the vibrant intellectual, cultural and social life of the university honors program. Classes, films, discussions and socials will be hosted by the Honors Learning Community. Members will enroll in a minimum of three Honors course credits per semester and participate in the University Honors Program. Membership in the community is available to students in good Honors standing for a minimum of two years. The Leadership Learning Community provides an opportunity for up to 40 first year students to explore the concept of leadership both in theory and practice. Students will attend leadership seminars (non-credit and for credit), listen to speakers, take field trips, and participate in specialized programs designed only for the learning community participants. Living in the Leadership Learning Community is a great way to start your college experience and meet others interested in making a positive impact on the UW-Eau Claire community! Apply leadership knowledge through involvement in bettering the campus community. Articulate the importance of and the practice of ongoing leadership development and lifelong learning. Understand the evolution of leadership theory, the variety of theories in practice, and how to apply theory appropriately. Understand themselves as leaders and how their leadership strengths and styles affect relationships with others. Program Requirements: Must enroll in IDIS 190 for the fall semester. Participation in the non-credit leadership seminar is strongly encouraged for members. Residents in the Outdoor Adventure LLC will discover the wonders and challenges of the great outdoors! You'll be introduced to outdoor adventure, wilderness stewardship and group dynamics. In addition, you'll have the opportunity to take part in adventure trips like indoor/outdoor rock climbing, low and high ropes courses, hiking in local parks, whitewater rafting, skiing, snowboarding and backpacking. Students will also have the opportunity to explore leadership by helping determine and plan the activities for the community. Are you interested in pursuing a career in health care? The Pre-Health Professional LLC is designed to support and guide students through their first year of pre-professional studies. With an emphasis placed on core pre-professional health sciences requirements and service learning, thePre-Health Professional LLC will prepare students for what they will need out of their college experience to be successful and viable candidates for the next step. Students with the following majors are eligible to enroll in the Health Professions LLC: Communication Sciences & Disorders, Kinesiology, or any Pre-professional health related program including but not limited to: Medical, Physician Assistant, *Nursing, Dental, Chiropractic, Occupational Therapy, Physical Therapy, Veterinary Medicine. The Social Justice Learning Community provides multiple opportunities for students interested in issues related to diversity and multiculturalism. Students in the community are involved in a variety of in-class and out-of-class experiences designed to develop a personal sense of social justice and provide ideas for how individuals can work for positive social change. Some of these opportunities include specialized classes, speakers, field trips and service opportunities that make a difference in the lives of others. Spanish language and culture. The LLC, located in Katherine Thomas Hall, would also be the site for events introducing other students and staff on campus and Eau Claire community to various aspects of the Spanish-speaking world. Living in this LLC will give you the opportunity to immerse yourself in the language and culture. You also will have the chance to serve as a cultural ambassador to the other resident hall students, campus community and to prospective students. proficiency in Spanish at a faster rate than other students enrolled only in regular, semester university Spanish class. In addition, you will have ample opportunities to engage with the Spanish-speaking population here in the Chippewa Valley and beyond. These experiences will demonstrate the direct connection between your studies and the multicultural world in which you will live. Program Pre-Requisites: Ability to enroll in Spanish or Latin American Studies. Program Requirements: Students must enroll in a Spanish or Latin American Studies Course in both Fall and Spring semesters. In the Sustainability Living Learning Community in students will be able to examine how their life choices affect the environment, social equity, the economy and people’s health. Students in any major are welcome. Once you have been accepted to the University and paid the $75 housing deposit, you should complete your online housing application. While you are inside the online housing application, you will be prompted to complete the section about Living Learning Communities. If you have a specific person in mind for a roommate, make sure they apply for the same Living Learning Community. Please note that students interested in the Honors LLC must be accepted into the University Honors Program as a pre-requisite. A separate LLC Retreat registration form will be mailed to your home AND emailed to your UWEC account, after Orientation (typically around the middle of July). The LLC Retreat is a fantastic opportunity for students to experience a unique set of activities with community members, explore the LLC theme, and connect with faculty and staff mentors! In addition, participants get to avoid the rush of Move-In Day, because LLC Retreat participants move in a full day before everyone else! There is a fee associated with the LLC Retreat. The affordable price of $65 gives students access to a day of meaningful activities, participation in the ropes course challenge, and an amazing picnic experience with your peers and faculty/staff mentor. Approximately half of the fee will be credited straight into the community’s program account, which will help fund activities and other LLC related ventures throughout the academic year. While not required, participation in the LLC Retreat is highly recommended. 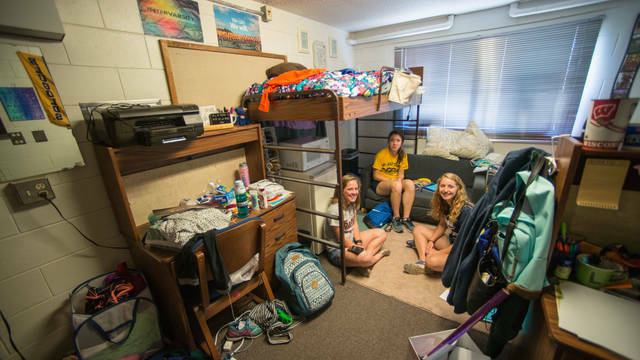 We want UW-Eau Claire to feel like your home away from home. Some of our residence halls house a living learning community. Consider joining one to participate in fun programming and meet new people!